1. Setting aside the real March Madness (NCAA Basketball) describe something happening at your house this month that might earn the title 'March Madness'? Well the weather has been a bit mad this month. March is always a little cranky, but things are looking more springlike the rest of this week. Also I hosted a baby shower which, in my opinion, is the best kind of March Madness. 2. What's a favorite made up word from your childhood or a favorite from your children's childhood? Does your family still use the word today? If there's a story behind the origin please share. A single word? We have a whole dictionary of favorites here. I might write about this at a later date, so for now I'll go with 'steffies'. This was my Daughter1's word for barrettes, and we all got on board with it. I had a friend with a daughter named Stefanie. She left barrettes at my house one morning, and I guess when Daughter1 asked 'what's that?' I replied with, 'Oh those are Steffie's' and the word stuck. Of the fifteen 'quick' tasks listed which two most need doing at your house? Will you do them? I liked this list and especially the idea of doing unpleasant tasks in chunks. We're in a new house so vents get cleaned regularly (construction fallout), drawers are not yet out of control, and hubs loves to clean that range hood so it is degreased on a regular basis. Of the tasks listed the two that most need doing are tackling the windows and washing baseboards. Both jobs will be done, probably by hubs and I together. 4. A favorite movie set in Paris or New York? I'm not a big Woody Allen fan, but I did love Midnight in Paris. New York is a little harder to pin down, but two favorites would be An Affair to Remember and Saturday Night Fever. I also really liked The Devil Wears Prada which has a bit of both, plus Anne Hathaway's amazing wardrobe! 5. What's put a spring in your step this month? Having both my girls in the same geography at the same time. 6. Did you ever want to be a teacher? Why or why not? I did and I was. Why? I always loved school and I've always loved working with children. I'm good with children and I think it's nice to work in a field that meshes with your natural God-given bent. I know teaching quite often gets a bad rap, but there are not many professions where you can truly make a difference in someones life the way a teacher can. 7. What's your favorite floral scent? Do you have this somewhere in your home or maybe in a perfume? How do you feel about florals in food? How about wines with floral notes-yay or nay? I'm kind of funny about floral scents outside of nature. I tend to go for more of the cinnamon, vanilla, and earthy fragrances in my home. Too much floral anything makes me feel a little sick to my stomach and I definitely don't care for it in perfume. I like dry wines, so typically not a fan of too much floral in my food or my drink. Now if we're talking actual florals, as in the kind that grow in the ground, then my favorite floral is the lilac, with lavender a close second. Joyce, Thanks for hosting. Your list made me think of another task that needs doing and that is cleaning all the wood blinds. I've found a company that will come to my home and do them and I think that is a great idea. Ah, spring. It's 23 degrees F here. Very much agree with you on the floral question! So glad you had both of your girlies around, a wonderful thing! Cleaning baseboards, a necessary chore. Really big sigh. OMG, Joyce what a way to wrap up your post. What an incredible video! Great pics and I loved An Affair to Remember too. Have a great week. I'm like you. I like the vanilla and cinnamon scents in my house. Florals tend to give me a headache. I didn't think of lilacs, but I love when our lilacs bloom. They smell so good. That video almost makes me cry when I watch it. What talent he is blessed with. Thanks for the Hodgepodge Joyce. Have a great day. I like the word Steffies. Cute! I guess the only made up word at our house would be jayisms, things said by my husband. Your daughters are so pretty and I'm sure the shower was wonderful. Your family just seems so perfect, close knit and fun. I prefer outdoor floral scents, too. Wow! what an impressive guy! Can't imagine singing and doing anything else. I'm just sure you were an awesome teacher. Your daughters are just so darling, make my heart smile and I know they do yours! "Steffies" -- what a great word! And so, so nice that you could have both of your girls home at the same time. One of my daughters lives far away, and it's usually only about every 3 years that she and her sister can get together and be here at the same time. Not easy, but doable with Skype and phone calls. Your pictures of your girls never fail to make me smile. 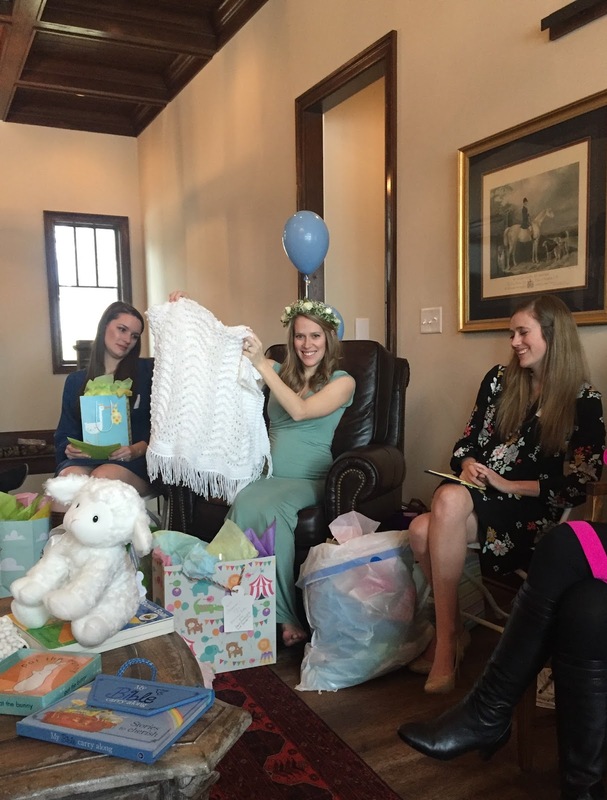 I am so glad you were able to get together to celebrate your soon-to-be grandson. I can just imagine the joy that shower gave you. Your daughter looks just adorable with her little bump. I didn't think of the devil wears Prada. That was a good one too! The video was just amazing! Looks like March has been a fun month with the baby shower and both your daughters with you. Lilacs do, indeed, have such a beautiful scent. Looking forward to them blooming here in a few months. Joyce, I'm with you...there is nothing in this world I enjoy more than having my family together. Brittany came home this past weekend and it was wonderful! Over much too quick! Lilac and lavender are both favorite floral scents of mine...I find them very calming. Have a great day! These were such fun questions today, Joyce, thank you. Yes, nothing like family to put a spring in a mama's step and a skip in her heart. Your girls just look like they are so full of life and a joy to be around. I learned a few years ago just because your house is new doesn't mean it doesn't need major cleaning. Ours continued to breath out dust for a long time. Have a great weekend in your little spot of heaven. Your daughter with the word "Steffie" reminded me of our daughter with the word "Clo". When she was less than two, she figured that if two items of clothing were clothes that one item of clothing would be a clo. This made sense and we sometimes use the word around here to this day. I have enjoyed reading your posts about the Baby Shower. So very special. The ideas for the shower are so fun, they make me smile. I loved the little lamb. Hello! I just found you a couple of weeks ago and have started to play along. I just want to tell you that I think the questions are so fun and such a great idea. Thanks so much for sharing. We could totally have a glass of wine and enjoy our scents together! Does this surprise you? I thought not. :) Your girls look like twins in this picture. So pretty! That was a great video...a nice twist at the end...literally and figuratively. Your girls are so lovely. They look related, too. I am sure that having them home at the same time is a delight. I really appreciate all you do regarding the Hodgepodge, including linking me up when necessary. I just don't understand why I can see it sometimes, and then not others. Sometimes it will just disappear after a while of being able to see it. Crazy! Oh, and I love that video of the man singing and painting. That's talent! Great questions as always. I hope your daughter had an empty suitcase to take all her gifts home with her! She looks radiant. I am so glad that you were able to have both...make that all three :)... of your babies there with you for the week. That is just wonderful and I know it means the world to you. I love your answer for #2. Our babies can come up with some interesting words for things, can't they? I miss March back home in SC, cranky weather and all. I remember one year we got a really good snow in March. That is highly unlikely to happen here!